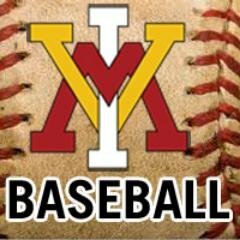 In one of the more bizarre games in recent VMI baseball history, the Radford Highlanders scored three runs in the seventh and two more in the eighth to break open a close game and defeat the Keydets, 15-9, in the finale of a three-game non-conference series between the clubs Sunday in Lexington. The game featured a near 15-minute delay which came mainly for illegal equipment, a runner interference call, a batter interference call and warnings to both dugouts, not to mention a combined 24 runs on 26 hits. Radford (18-24) took a 10-7 lead into the seventh, after the Keydets (18-25) had brought the tying run to the plate multiple times in the fifth. In that seventh, a three-run home run by Jonathan Gonzalez – his 10th of the year – made it 13-7, and two more runs in the eighth opened it to a 15-7 contest. A two-run homer by Peyton Maddox in the bottom of the eighth cut it to 15-9, but that would prove to be the final margin as Radford took the series. The contest was dominated by the offenses, as the score indicates, with Gonzalez going 3 for 5 with five RBI and Anthony Miano falling a triple shy of the cycle in a 3 for 5 day of his own. Maddox and Matt Dunlevy had three hits apiece to lead the Keydets. RU jumped out to the early 6-1 lead despite a first inning homer from Collin Fleischer, but the Keydets got back in the game in the fourth. A three-run home run by Matt Pita, his first since returning from a near-six week absence, cut the margin to 6-4. The oddities began in the fourth, when, with one out, Gonzalez appeared to swing and miss at the first pitch from starter Mason Adamson. Play was stopped and Gonzalez’s bat was inspected at length, and, after a delay of some 7-8 minutes, the bat was removed from play due to being deemed illegal. During the delay, however, Adamson was removed from the game due to an undisclosed injury, thereby lengthening the stoppage in play even further as Matt Eagle came in to relieve the freshman. RU would score four times in that fourth inning and go up, 10-4. With one out in the visitor half of the fifth, Kyle Butler hit a pop up near the first base foul line. The ball appeared to get caught in a gust of wind and blow from foul ground into fair, surprising first baseman Ryan Smoot, who got tangled with Butler as the ball fell in fair territory. Butler was ruled out for interfering with the play. With the Highlanders still leading, 10-4, the Keydets cut the margin to 10-7 in the fifth. A RBI double by Dunlevy made it 10-5, and two runs scored when shortstop Clayton Baine misplayed a grounder off the bat of Josh Hollifield. Michael Diodato followed with a walk to bring the tying run to the plate, but Jacob Jaye struck out and Fleischer flew out to the warning track in right center to retire the side. That would set the stage for RU’s five combined runs in the seventh and eighth, with the batter interference call coming on Hrbek in the eighth. After Maddox’s homer made it 15-9, the final five Keydets were retired to close out the game. Adamson (0-3) got the decision for the Keydets, as he gave up six runs, only two of which were earned, in 3 1/3 innings in his first collegiate start. Evan Threehouse (2-0) pitched a perfect inning in relief with two strikeouts and was the winner for RU. VMI baseball will return to action Tuesday, when the Keydets play host to the VCU Rams at Gray-Minor Stadium. First pitch is set for 6 p.m.